Battle the blaze and keep the TV stations on air! Get your firefighting gear on, there's a fire at the TV satellite tower! Rush to the scene in the Fire Utility Truck to fight the flames. Climb in the cherry picker and use the special stud-shooting hose to douse the flames from above. Adventure doesn't take a break in LEGO® City! •	Includes 3 minifigures: a technician, female firefighter and a male firefighter. 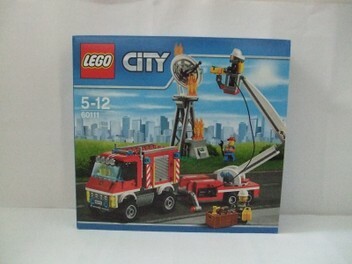 •	Features a Fire Utility Truck with fire hose and trailer with extending cherry picker, TV satellite tower with satellite dish and a utility box. •	Shoot the water elements with the stud-shooting hose and knock down the fire. •	Accessory elements include a box containing 2 sets of smoke gear, fire extinguisher, wrench, axe, saw, hammer, mug, 3 sets of flames and 4 water studs. •	Fire Utility Truck measures over 3” (9cm) high, 5” (13cm) long and 2” (6cm) wide. •	Trailer measures over 2” (6cm) high, 6” (19cm) long and 1” (8cm) wide. •	Satellite tower measures over 7” (18cm) high, 2” (6cm) wide and 2” (6cm) deep. Payment is expected within 4 workings days unless prior arrangement has been made.